Mitchell Silver, NYC Parks Commissioner, and Alison Mariella Désir-Figueroa, Harlem Run Founder. Monday, November 26th we celebrated #HarlemRunTurns5 with family and friends in East Harlem at the Spring Moves Loft. Little did we know, the NYC Parks Commissioner and Harlem Run Member, Mitchell Silver, surprised us with the news that where we meet every Monday Night will be known as “HARLEM RUN PLAZA”!!!! Next time you’re in Marcus Garvey Park, stop by, take a picture and use #HarlemRunPlaza when you share on social media. We look forward to seeing you out there! Join us in starting off the new year with a challenge to get the momentum going on your fitness journey. ADD ALISON MARIELLA AS A FRIEND on MapMyRun to be added into the challenge. Participants will be responsible for tracking their exercise via MapMyRun. Note: you must select the category of “RUN” for your miles to count. One logged exercise (run/walk/run-walk) per day. The person with the most miles accumulated at the end of the month will win a prize courtesy of UARun. 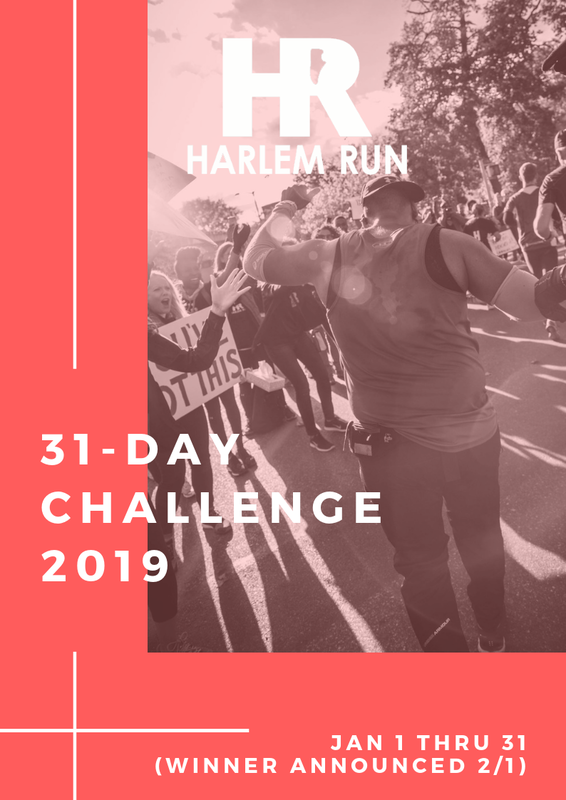 Share your progress on social media using #HarlemRun and #HR31DayChallenge. Starting today thru January 1, 2019, all of our gear on HarlemRun.bigcartel.com can be yours for 50% off! If you were looking to grab some winter gear or prepare for Spring/Summer, use the code HARLEM50 at check out and grab your gear. Thank you all for representing for the movement! Hello everyone! Another month has come and gone, and we are always grateful for your support in The Movement. We wrapped up the summer with trails in Vermont, a cheer station in our backyard at the Percy Sutton 5K, and long runs in collaboration with CustomPT. What’s next for us, and what’s coming up this fall? Here’s a look at some exciting new things going on! In collaboration with Run4AllWomen, we will be meeting at Shirley Chisholm Circle in Brower Park (Brooklyn) at 10am for a 4 mile run and walk to raise money and awareness for upcoming midterm elections. Your vote matters — so show up and show solidarity. There will be a Voter Registration Drive so please bring any friends or family members who may be in need of this service. Are you running a marathon this fall and plan on rocking a Harlem Run shirt/hat/other gear? If so, come out for a picture with The Movement! Please be sure to wear HR gear and arrive early (~9am). There will be no additional dates, so this is the one and only photoshoot day! Last year, one of our Harlem Run Dads reached out with a design idea for the 2017 Marathoners. Inspired by that initiative, this year we are holding a design contest for anyone interested in submitting a creation to be chosen as our 2018 NYC Marathon Class Singlet. Please DM @harlemrun ‘s instagram if interested (linked above). We hope you will join us for the exciting things to come this month! Feel free to leave any questions or comments below. Happy training! I’ve always found peace of mind when it came to exercise and sports. I ran track and field at 12 years old and enjoyed it until I was diagnosed with Asthma at 13. Over the past couple of years, I’ve been on a personal journey for self improvement and decided to become a part of the Harlem Run family 5 months ago in an effort to stay physically fit and mentally healthy. Over the last 14 months, I’ve managed to shed 45 pounds thus far. My experience with Harlem Run has been rather encouraging. I know a lot of the members outside of running but it’s been great getting to know them better through another outlet. Running has also helped me as a form of therapy. I’ve suffered quite a few tragedies and personal losses over the years and I now use running as a way to release emotions and pain that still exists within me. As an struggling asthmatic, I’ve always had the fear of triggering it through physical activity but since I’ve started running, I moved up in 2 different minute groups therefore keeping it under control. And as I prepare to start my training for the 2019 NYC Marathon which I will take this challenge head on with courage and support. I am very grateful for the opportunity to be able to grow through intellect, athleticism and resolve and I must thank the Harlem Run Family for the overwhelming support.